This hand-held dynamometer lets you objectively measure manual muscle strength and functional task requirements for almost any application. Offers full portability and ease of use for a fraction of the cost of expensive computer controlled systems. Available in 200 lbf and 500 lbf capacities, these rugged mechanical instruments accurately measure (±0.5% FS) instantaneous push or pull forces generated by the test subject. A calibrated dial shows instantaneous force. An easy-to-use peak force switch freezes the pointer at the maximum force for simple identification and analysis. 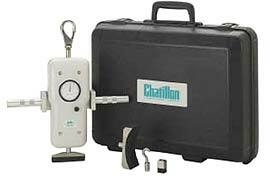 Gauges come complete with handle assembly and carrying case. Use with optional (FCEK) or (MSCK). All DMG Series gauges come standard with a Certificate of Calibration with data verification to NIST. Accurately measure and document musculoskeletal strength to determine patient condition and serially track progress. Evaluate individual muscle groups in flexion/extension, internal/external rotation, plantar flexion, dorsi flexion and abduction/adduction. Conduct job task analysis, ergonomic analysis, and ADA compliance evaluations. Measure actual push, pull, and lift forces of a particular job task, then quantitatively evaluate an individual's ability to perform each task. Ensure an employee's ability to work following an injury. Objectively quantify an athlete's musculoskeletal force output. Evaluate and document the effectiveness of a prescribed training program. Serially track each patient's progress.